Last week we were notified by both Citibank and Barclays that there will be changes coming to their affiliated American Airlines credit cards. Through the end of April both cards will continue to offer you a 10% rebate on award tickets, up to a maximum of 10,000 miles per year. Starting May 1, 2019, this benefit will be removed from both cards. So if you were thinking about redeeming AA miles, do it sooner rather than later. Remember that AA allows you to change dates and routings on award tickets, as long as the starting and ending point remains the same. There are other changes, both positive and negative as well though they vary by card. – If you spend $20,000 on the card during your cardmember year you’ll get a companion certificate for $99 plus taxes and fees. – Resuming a trial program they had last year, your final total each month will be rounded up to the nearest whole dollar and for each penny it’s rounded up you’ll be given 1 AAdvantage mile. So if your total spent for the month is $xx0.45 it will be rounded up to $xx1.00 and you’ll earn an addition 55 AA miles. – If you (like me) had a version of this card that was converted from the old US Airways president’s card that earned 10,000 miles each year when you renewed your card, that program will be discontinued. You will receive your last 10,000 mile bonus upon the next renewal after May 1, 2019. – Barclays hands out discount certificates for $100 off an AA flight if you spend $30,000 or more during a cardmember year. This program is also being discontinued effective with your next anniversary date on or after May 1, 2019. – The annual fee will increase to $99 from $89. Even the supposedly positive changes are mostly negative to me. I fly to meet up with friends and only very rarely fly an entire route with someone so I don’t need the companion pass. I’ve never used wi-fi on a flight so while that’s nice, it’s not something I’ll likely use. I wouldn’t mind the Flight Cents program but am not lost without it. As for the negative changes, I’d already concluded that it was a waste of my time to manufacture spend $30,000 for a $100 certificate so I hadn’t planned to do that this year. The annual fee increase is not a deal breaker. The loss of the 10,000 miles per year just for owning the card is the big hit here. The changes here aren’t quite as drastic. The card will not lose any other benefits and if you spend $20,000 per year on the card you’ll get a AA discount certificate whose value is being increased from $100 to $125. I’ve owned Barclays AAviator card for a number of years and have held on to it primarily for the 10,000 mile bonus each year. With that feature gone, I’ll try to product change this card to something else or cancel it when my cardmember year is up in December. I’ve had the Citi AA card for over 20 years so I’ll hang on to that for the free checked bag and priority boarding. It’s a real shame these benefits are being removed. As bad as American’s been lately you’d think they’d be looking for ways to entice the public to use their cards but that appears not to be the case. The Citibank AAdvantage® Visa was the first rewards credit card I ever had and I’ve held on to it through various iterations including a switch to MasterCard for over 20 years. But it’s one I keep for the benefits instead of for its earning power. To me the primary benefits are a free checked bag on domestic flights and the 10% rebate on miles when purchasing an award ticket (up to 10,000 miles per year). But at present the card earns 2x miles on all American Airlines purchases and 1x miles everywhere else. While I do have a couple of small recurring charges on this card, I spend less than $50 per month on it. 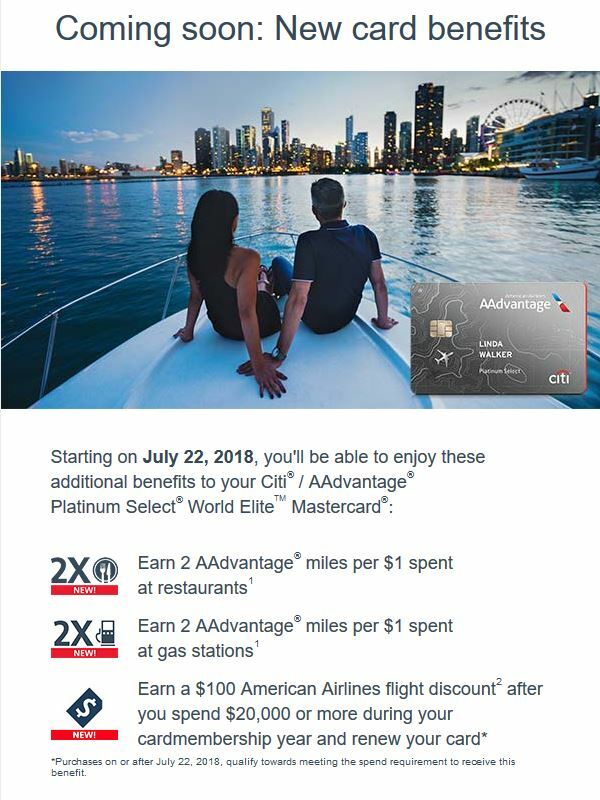 Starting July 22, 2018 it seems that Citi will attempt to get me to spend more on this card by offering 2x miles at restaurants and gas stations as well as a $100 AA flight voucher if I spend $20K or more during my cardmember year and renew the card. They’ll also raise the annual fee from $95 to $99 which seems…cheap. My reaction: well, it’s better than nothing. But if Citi was hoping to drive me to use this card more often, this is not going to do it. I already get 3x Ultimate Rewards points per dollar at restaurants through my Chase Sapphire Reserve card. I get 3x of Citi’s own Thank You Points per dollar at gas stations via the Citi Premier card. 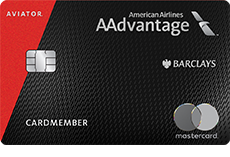 Thanks to my Barclay’s American Airlines AAviator card I can earn that $100 voucher for $20K spend, get the free checked bag AND, thanks to having converted that card over from the US Airways card, I get 10K miles bonus each year I renew. The only reason I keep this card is for how it’s helping my credit rating’s average age of accounts score and the 10% mileage rebate though that only helps in years when I redeem AA miles. And it’s frustrating to me when I want to book an international trip as soon as the window opens but AA hasn’t released ANY award seats from Memphis to an AA hub so I have to buy a positioning flight. So, nice try, Citibank but let’s see if you can do better.